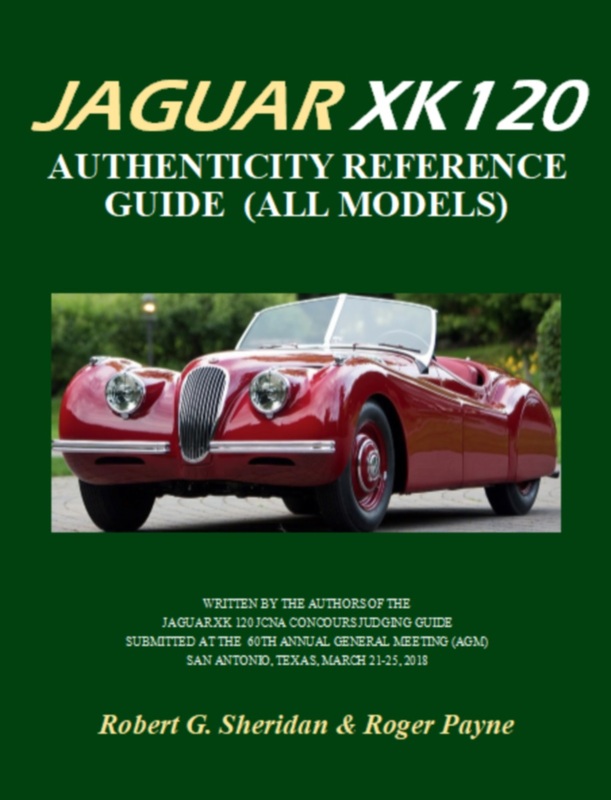 The Jaguar XK 120 Authenticity Reference Guide (All Models) "Second Edition" hard cover book by Robert G. Sheridan and Roger Payne. Over 300 pages, provides XK 120 owners and restorers worldwide with a definitive authenticity guide for describing and picturing XK120 parts as they were originally supplied from the Jaguar Factory. Organized by Exterior, Interior,Boot, and Engine Compartment. The book features hundreds of color pictures of XK 120 cars and parts. Many original XK 120 pictures by Urs Schmid from his books, Jaguar XK 120, The Anatomy of a Cult Object (vol 1 &2) are used with permission from the Urs Schmid family. Several detailed illustrations are used with permission from Bernard Viart from his book, XK 120 Explored (published by PJ Publishing Ltd) Paul Skilleter Books. Written for the serious XK 120 owners and restorers, the second edition book provides the most accurate and up-to-date jaguar XK 120 authenticity reference information available anywhere in the world. The second edition book contains updates, corrections and new information not contained in the first edition. NOTE: The author also wrote the Jaguar XK 120 Concours Judging Guide, presented at the 2018 Jaguar Clubs of North America Annual General Meeting (AGM). For more details, visit the authors website: www.xk120authenticityguide.com. NOTE to overseas customers: For the United Kingdom and European Customers: Order from www.paulskilleterbooks.com. For Australian, New Zealand and South East Asian customers; Contact rogerpayne bigblue.net.au.